From the view of alternative investments, bonds have had the best returns for the past 40 years. Well almost. There are periods, some recent, where bond prices have gone down anticipating higher rates that never came. When we think of buying a bond funds, any of a large number of ETFs, the elephant in the room is the risk of interest rates turning higher. It will happen – someday – and we need to know how to recognize it. All interest rate markets are very trending. They key of Fed policy which concentrates on the shorter end of the yield curve. The Fed is very methodical. It raises rates a little and checks how the economy reacts, then raises rates a little more. That creates a trend. The Futures Industry, that is, Commodity Trading Advisors (CTAs), have prospered by overweighting interest rates in their managed portfolios. But many investors are concerned about the leverage in futures and prefer using ETFs. In order to gain the most, and be first at recognizing a change in direction, we want to apply a simple trend method to the interest rate ETF that has the smoothest price movement. A smoother price, that is, less noise, will result in more accurate trend signals. I’ve had a lot of experience analyzing risk and picking stocks, but when I try to decide which bond fund is best, the process is confusing. Each fund has a different amount of history, the performance is displayed differently by each company, and they focus on returns, somehow implying that it’s enough to make a decision. It’s not. Table 1. Selected bond funds. The managed, such as PIMCO’s BOND and the SPDR TOTL, apply a tactical approach, adding and removing various cash bonds according to some process (never disclosed). The use of a strategy can result in either over or under performance, lower or higher risk. There are no guarantees. Each firm publishes performance differently, so I find it best to go to a single website, such as Yahoo Finance, to get the results all displayed in the same format. You can also download the daily data from Yahoo into a spreadsheet and look at the numbers yourself, which is always a good idea. After all, it’s your money. 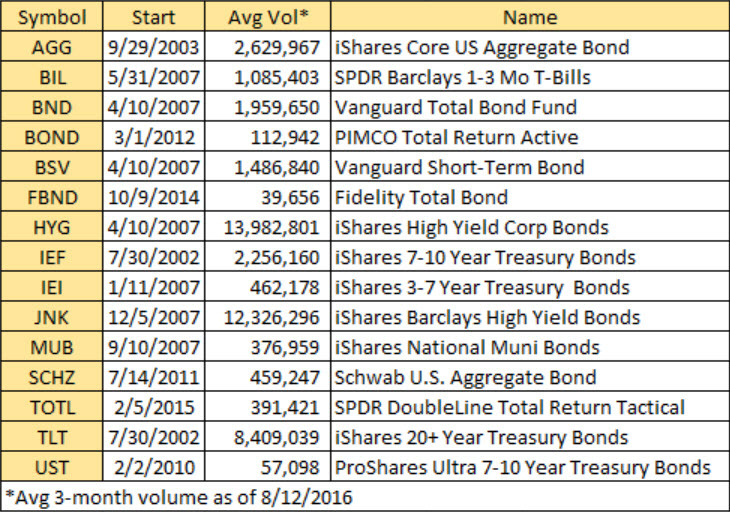 Using the downloaded data, Table 2 shows the comparative returns of the 14 ETFs, in order of oldest starting date. Table 2. Annualized returns of selected bond funds from inception. What jumps out is the huge outperformance of TLT and UST. Other good returns are shown for JNK, HYG, IEF, and FBND. In Chart 1 we see that TLT and UST have a similar pattern of returns, as does IEF and AGG. 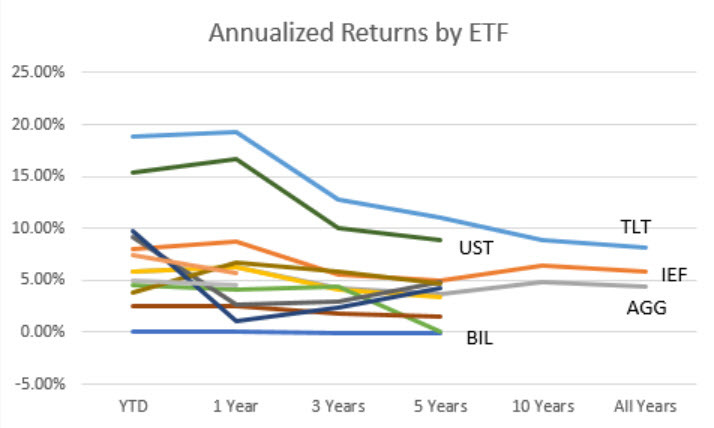 BIL holds the honor of having the worst returns. Most of these top performers also have the highest volume, with the exception of UST. Is this a no-brainer? Is TLT the best choice? In addition, will it tell us when the trend turns and rates go higher? Chart 1. 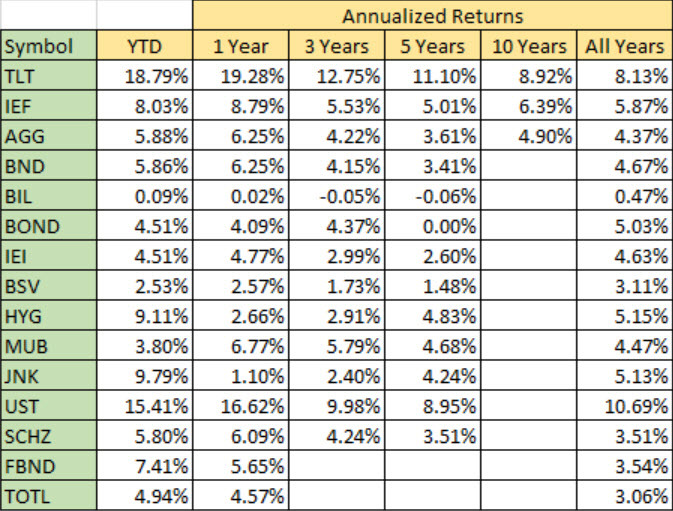 Annualized returns by year. Each line is a different ETF. I said that we all tend to look at returns to make our choice. But what if you had to lose 50% of your investment before making 15%? There are some patterns of returns that are just not acceptable. 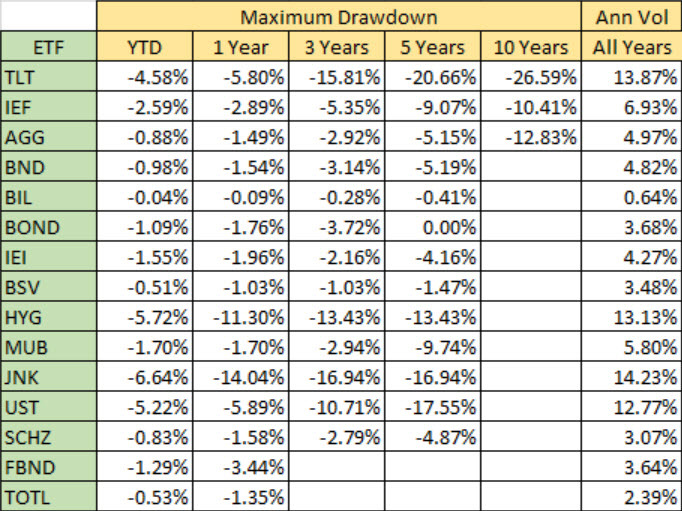 To find out, let’s look at the maximum drawdown needed to get these returns. Table 3 shows that, in the past year, in order get a return of 19% compared to 6% (TLT is 3.1 times more than AGG), you would have needed to take a risk 3.9 times as much as AGG. That doesn’t seem like much, but TLT had an absolute drawdown of 5.8% compared to AGG’s 1.48%. We now have a case of investor risk preference. Are you a risk taker or a conservative investor? Table 3. Maximum drawdown, measured as a percentage from the peak returns, and annualized volatility since inception. More important is the long-term risk. The more data you see, the more likely you’ll have higher risk; therefore, the ETFs with at least 5 years (which don’t include 2008!) are more realistic than the newer ETFs. Over 10 years, TLT had a drawdown of 26% with a return of only 9%, while AGG had a drawdown of 12.8% and a return of 4.9%. We can decide which is a better payout using the Calmar ratio, AROR/Max Drawdown, even though we can expect drawdowns sometime in the future to be larger. The results are shown in Figure 2. Chart 2. 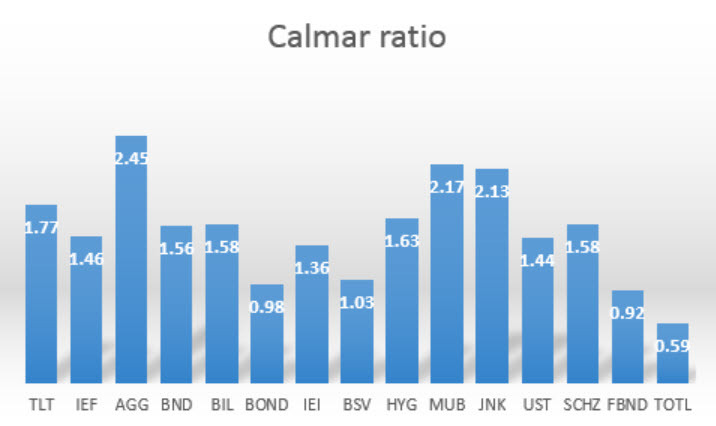 The Calmar ratio for all ETFs since inception. Based on the Calmar ratio, AGG, MUB, and JNK are the best choices. If you consider the drawdowns by themselves, TLT would be eliminated because it has a drawdown of 26%, more than twice any other ETF. Which ETF Will Tell Us When the Rates Change Direction? Now we come to the main problem, if we apply a simple moving average, which ETF will have the most accurate signal to tell us that the direction of interest rates has changed? For that answer, we introduce the concept of market noise. Price movement has no noise when it goes in a straight line, and it’s all noise when it bounces up and down but gets nowhere. Think of it as a drunken sailor’s walk. Setting out, he leaves the ship and walks in a straight line to pub where he enjoys the evening. On the way back, he staggers forward and back, side to side, taking 30 minutes to get back to the ship when it had taken him 5 minutes to get to the pub. His return path is noisy. We subtract the calculation from 1 so that a value of 1 means a lot of noise, and a value of zero is no noise. It’s intuitively easier to see that on a chart. The purpose behind this is that, the less noise, the easier it is to recognize a change of direction. Chart 3 shows the calculated noise for each of the ETFs. Chart 3. 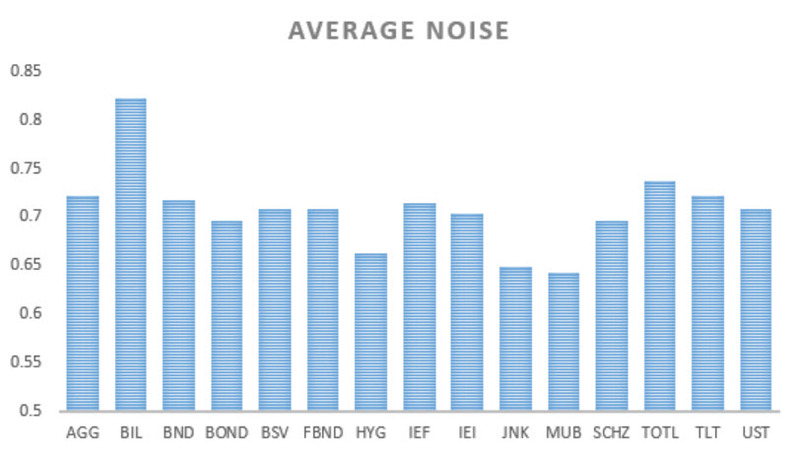 Average 10-day noise for each ETF. Based on noise, the three best candidates are MUB, JNK, and HYG, in that order. To verify that, and see the final result, we apply a simple moving average to each of these ETFs. To be sure we are not just lucky, or overfitting the data, we’ll look at a range of moving average results, from 10 days to 120 days. When the moving average trend is up, we are long, and when it’s down, we are short. The ETF with the best returns will be the one that is most reliable. But we’ll go one step further and divide the cumulative returns by the volatility of the daily returns to get the best payout. Table 4 shows the results as a heat map, where green is the best and red the worst. Table 4. Heat map of ratio of cumulative returns to volatility of daily returns. The results show that MUB (Municipal bonds) and JNK (Junk bonds) run neck and neck, with HYG (High-yield bonds in third) while the short-term maturity BIL cannot produce profits. That means the moving average trading signal for MUB and JNK are reliable while that only generate losses for BIL. Moreover, MUB and JNK are better for nearly every moving average calculation period, a sign of robustness. Because we did not include trading costs, it may be that the higher profits generated by the 10- and 20-day trends are pared because they have more trades. The gross returns for each ETF from 2007 or from inception, whichever is later, is shown in Table 5. Table 5. Heat map of total returns from 2007 or inception, whichever is later. From the ratio in Table 4 and the returns in Table 5, we can conclude that JNK is the best ETF for both systematic returns and for recognizing when interest rates turn – the elephant in the room. The lesson here is that risk is more important that returns, and a market that is more orderly will be better for applying a systematic strategy. Of course we all want good returns, but they won’t be realized if the risk is too high. Most investors choose to close out their positions when they see a large loss rather than chancing an even bigger loss in the hope of recovery. We hear the news commentators talk about how a good investor held their positions during the 2008 crisis and are now well ahead. Unfortunately, most of the people that I know did not hold their positions and have not made back the losses from 2008. So look hard at the risk before you choose which fund to buy. Chart 4 shows that a simple chart may tell you all you need to know. Chart 4. 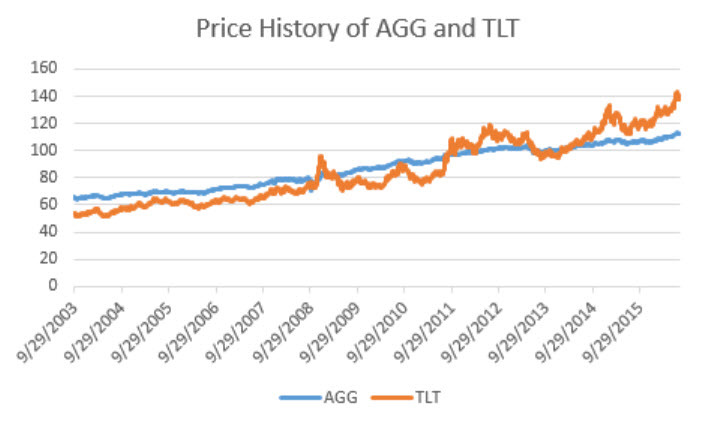 Price history of AGG and TLT from inception of AGG on 9/29/2003. Perry Kaufman is a financial engineer and trader. He is the author of Trading Systems and Methods, 5th Edition and A Guide to Creating a Successful Algorithmic Trading Strategy. For questions, comments, or more information, visit his website www.kaufmansignals.com.